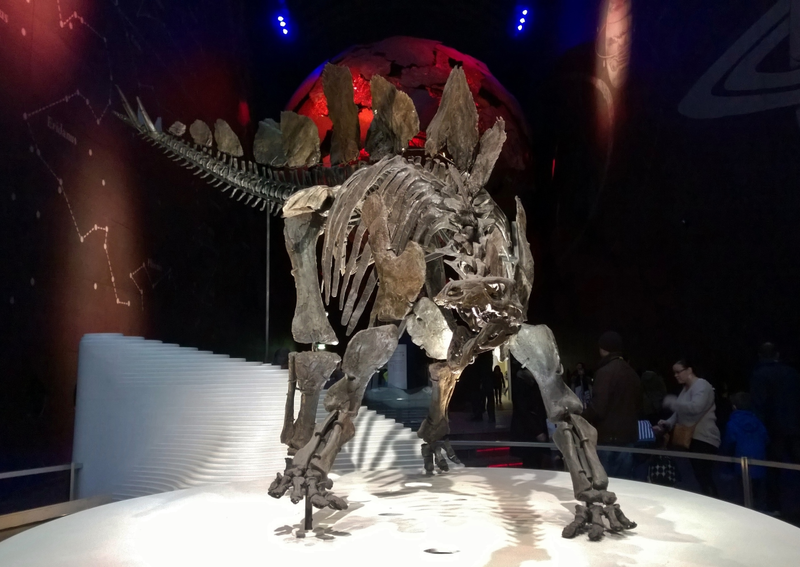 The unveiling back in early December of the world's most complete Stegosaurus skeleton at London's Natural History Museum won't have escaped many folks within the palaeo community. Naturally, as the UK contingent of LITC and being within easy distance of the museum, Marc and I were duty-bound to make our own visit to the new treasure, even if we were over a month late (where were our invitations to the official do, pray?). With over 90% of the original specimen present, 'Sophie' is a permanent addition of which the NHM can be justly proud. Rather than being secreted in the now problematic Dinosaur Gallery -- about which much has been written here and elsewhere -- she is instead given prime position of her own in the Earth Hall, near the museum's Exhibition Road entrance, paralleling that of 'Dippy' the Diplodocus in the central Hintze Hall. Mounted in a dynamic, defensive stance, she occupies a rather swanky platform of serried steps, somewhat reminiscent of the atrium of New York's Guggenheim museum. Obligatory photographic evidence of the intrepid goons' actual visit, taken by Nicole Heins -- who once contributed her own guest post! Our readers will have doubtless seen Bob Nicholls' stunning painting commissioned by the museum as part of the exhibit. From the sublime, therefore, you will now be treated to the ridiculous: this doodle I drew on a Moleskine leaflet a while ago in an unoccupied moment (Marc said to include it in the post, 'fo sho', so there it is). *I've since been informed by a friend who works at the NHM that the museum does indeed have the complete skull, and that the one on the mount is a 3D print of it! Well, Cupid is getting ready to step up to the plate, so best to start thinking about how you're going to tell twelve people - or any other multiple of twelve - how much they mean to you. 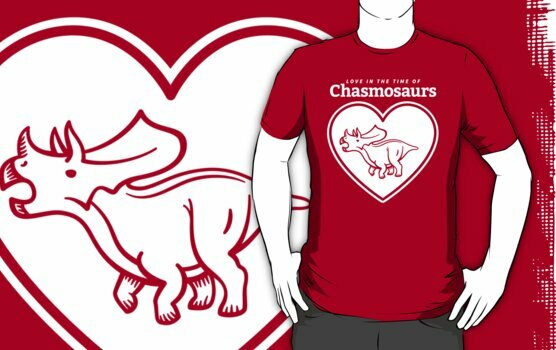 To that end I've drawn a valentine with a dinosaur on it, based on a great little one-liner thought up by my life partner, spouse, and BFF, Jennie. but what about that odd multiples of twelve bit up above? 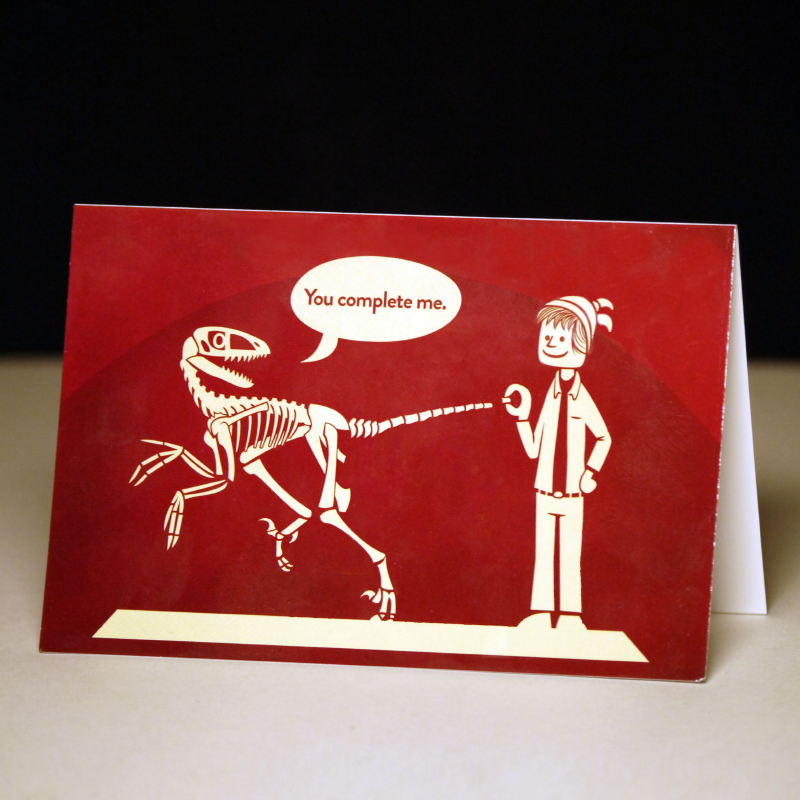 Well, you can actually purchase this card with three other designs - by Randall Munroe, Zach Weinersmith, and Rosemary Mosco no less - in a set of twelve. So whether the objects of your affection fancy planetary physics, entomology, parasitology, or palaeontology, you are covered. Pick 'em up from the XKCD store! Jim Lawson of Paleo: Tales of the Late Cretaceous has a new comic project called A Walk Through Dinosaurland. It looks great! The funding goal has been met, but that shouldn't stop you from grabbing some perks. Hat tip to Palaeoblog for the catch. After a long break from the series, I'm back with my first Vintage Dinosaur Art post in almost two years. Inspired by the cartoony style of Marc's post on Dinosaurs! 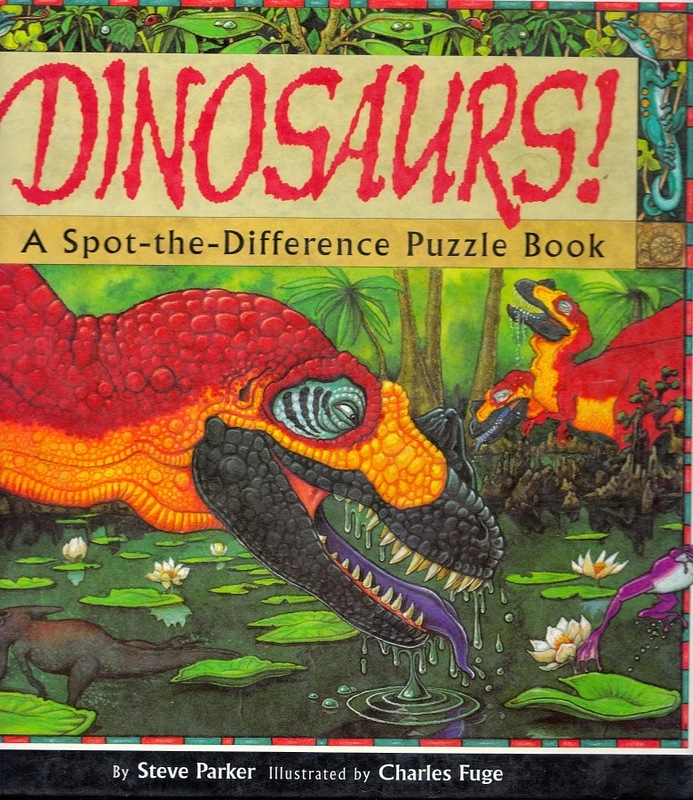 A Spot-the-Difference Puzzle Book, I scanned a recent acquisition of my own, Travels with Dinosaurs. The book itself has scant information about the publication, but searching the web leads me to a publication date of 1997, making this not-quite-vintage, but it certainly is in spirit, so off we go. The book was written by children's author Vezio Melgari and illustrated by Giovanni Giannini and Violayne Hulné. 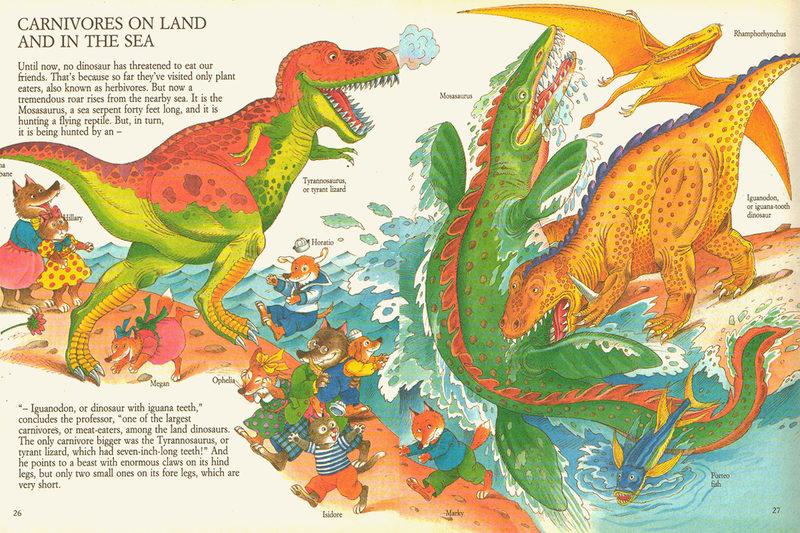 There's sadly no indication how Giannini and Hulné collaborated on the illustrations, which strongly resemble the work of Richard Scarry. Melgari's story is about a group of young animals - mainly of the canine persuasion, with a cat or two thrown in the mix - who are taken on a virtual reality trip through time by the Professor Alfred S. Wolfsbane, "specialist in several sciences and wizard of the computer world." It was the nineties! Of course, for our purposes, we're more concerned with how the dinosaurs are presented than we are in the story. The first trip is to visit the "floating giants," AKA sauropods. Though Apatosaurus is depicted in its classic mid-century habit of standing half-submerged in water, it is referred to by the correct name, and the text even makes reference to the obsolescence of "Brontosaurus". 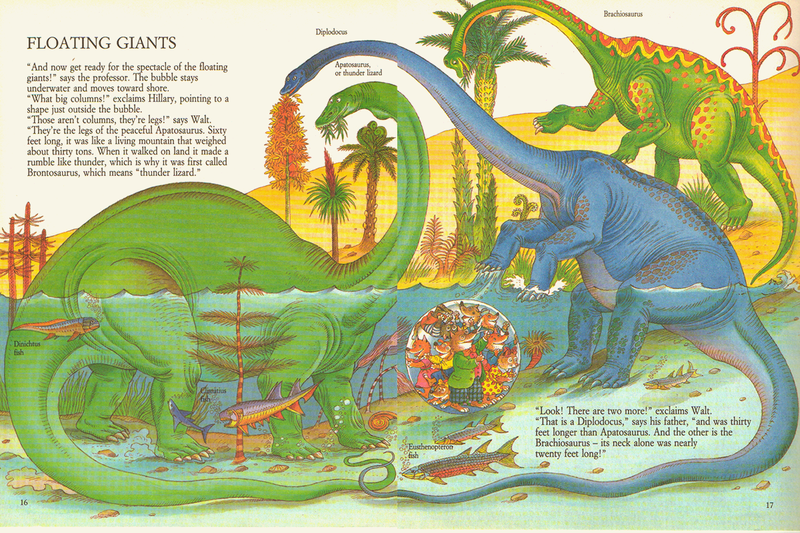 The spread is a good introduction to the book's primary color aesthetic and odd mix of outmoded and contemporary ideas, as well as its admirable dedication to including smaller fauna in the mix, generally well labeled, as in the fish swimming around the sauropods' legs here. The sauropods of Travels with Dinosaurs: Apatosaurus, Diplodocus, and Brachiosaurus. 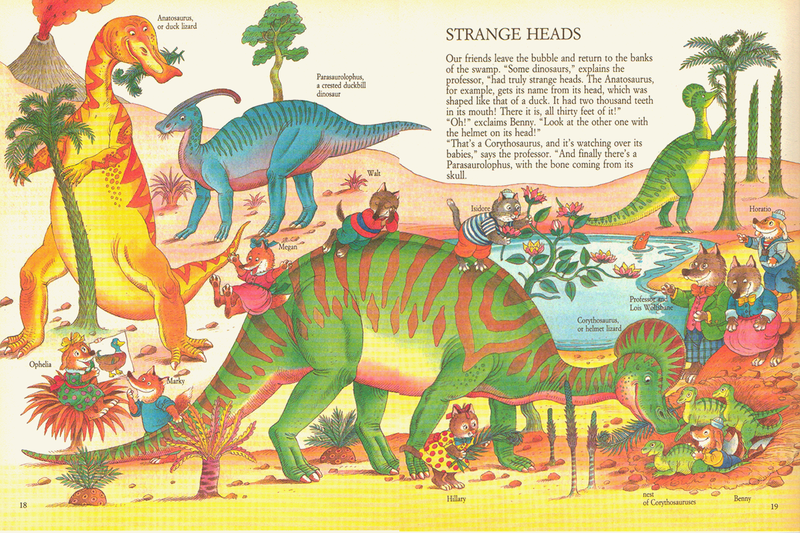 Next up are various hadrosaurs, singled out for their "strange heads", since the variety of hadrosaur headgear has always been a popular focal point of picture books. Most interesting here is "Anatosaurus", which by the late nineties had been officially folded into Edmontosaurus for about a decade. It's standing in a familiar Knightian bipedal position (and creeping up on a tree fern in an unsavory way). The landscape combines the old and new again, repeating the old trope of barren, volcano-populated landscapes but also nodding to the Cretaceous flourishing of angiosperms. Thyreophorans get their spotlight next. 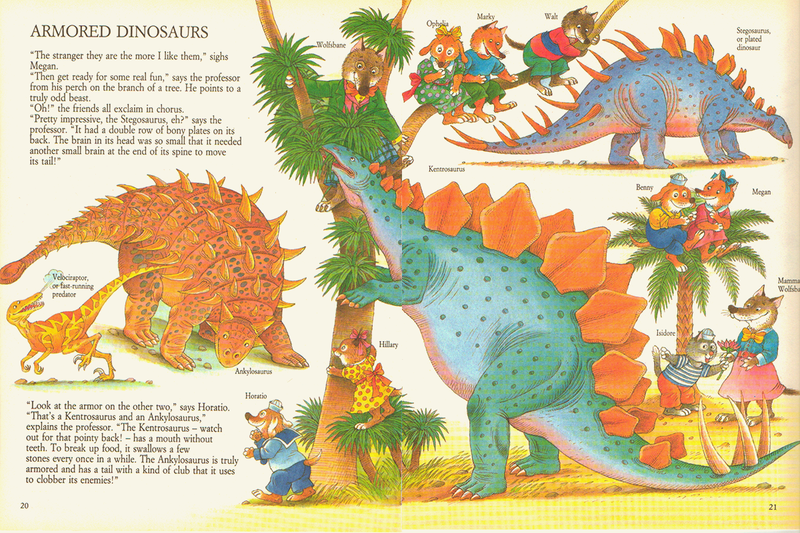 Stegosaurus is featured front and center, as expected, rearing on two legs and munching on foliage, an old tradition. Velociraptor makes an appearance, menaced by Ankylosaurus and high-tailing it back to Asia (and presumably its own time, a couple million years previous). At least it's recognizable as a velociraptor-ish animal, rather than a generic post-JP raptor. 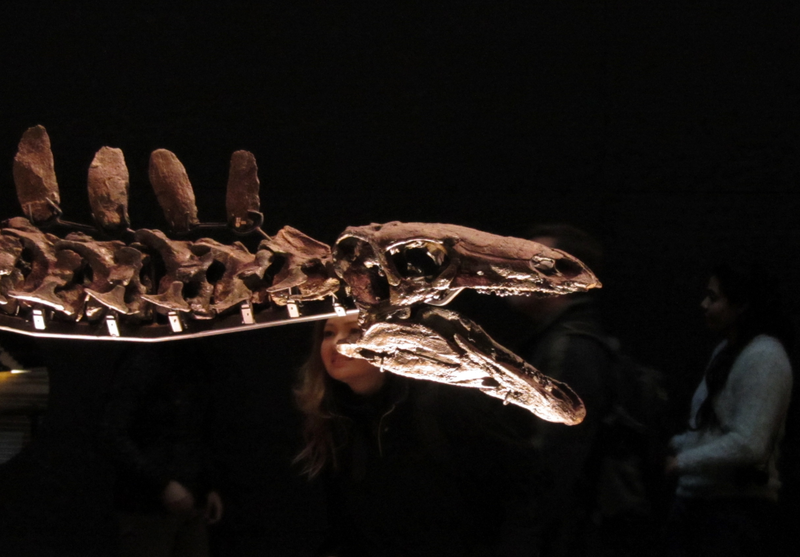 Kentrosaurus is stripped of its teeth, which was never the case; though its original description only included a single tooth, and only fragments of teeth or emerging teeth thereafter, I'm not sure that toothless Kentrosaurus was ever a big theory - gladly corrected if it was. Appropriately enough, Triceratops takes center stage for the ceratopsians, with fellow old standby horn-faces Monoclonius and Styracosaurus playing back up. 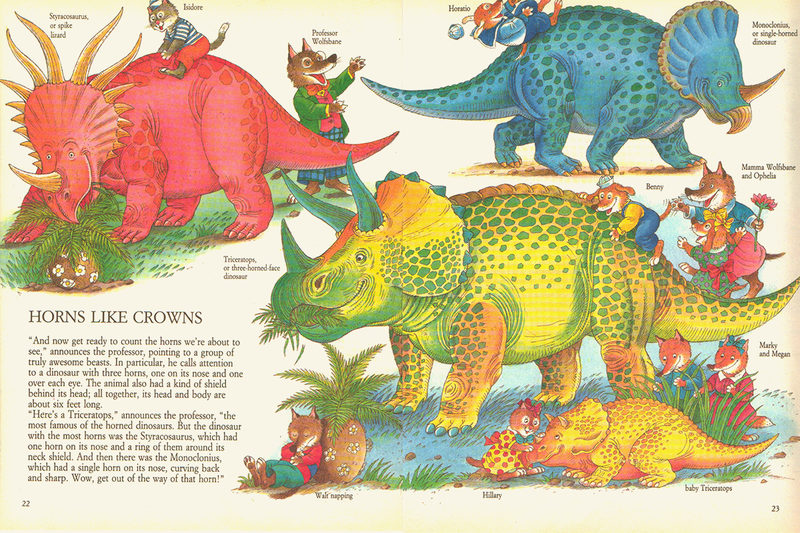 Check out the pretty-well-rendered noggin morphology of the baby Triceratops, huddled in the lower right-hand corner. 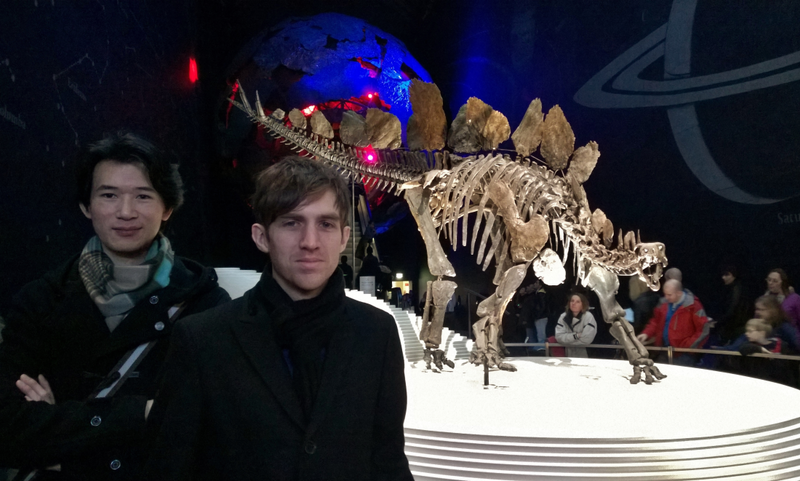 The carnivores, appropriately enough, are represented by those twin titans of terror, Tyrannosaurus and... Iguanodon. Yeah, Iguanodon, tearing into Mosasaurus. Prof. Wolfsbane calls it "one of the largest carnivores... among the land dinosaurs," only bested by Tyrannosaurus. I don't know where this came from, other than Louis Figuier's famous, anachronistic Megalosaurus v. Iguanodon battle, in which it can safely be presumed that Iguanodon is merely fighting for its life, not trying to nom on its opponent. If anyone knows of any other depictions of a predatory Iguanodon, please let me know what I've missed. It's almost as if Melgari smooshed Megalosaurus and Iguanodon into a single wuzzlesaur, with the stereotypical skulking gait and predatory nature of the former and the thumb-spike of the latter. I love the glee on the face of Rexy, as if he's just thrilled that Iguanodon has changed teams and wants in on the action. The terrible predators, Tyrannosaurus and Iguanodon. 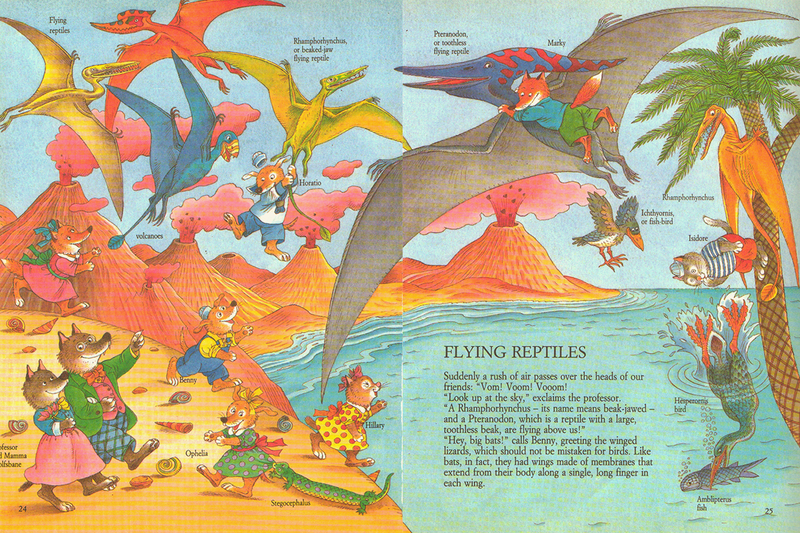 The book's pterosaurs were cast in the old-school, leathery-demon mold, with little attention paid to scale or temporal accuracy. And hey, since we're at the seaside, Ichthyornis prepares for a water landing, and there's a typical Hesperornis. Look at it dive. 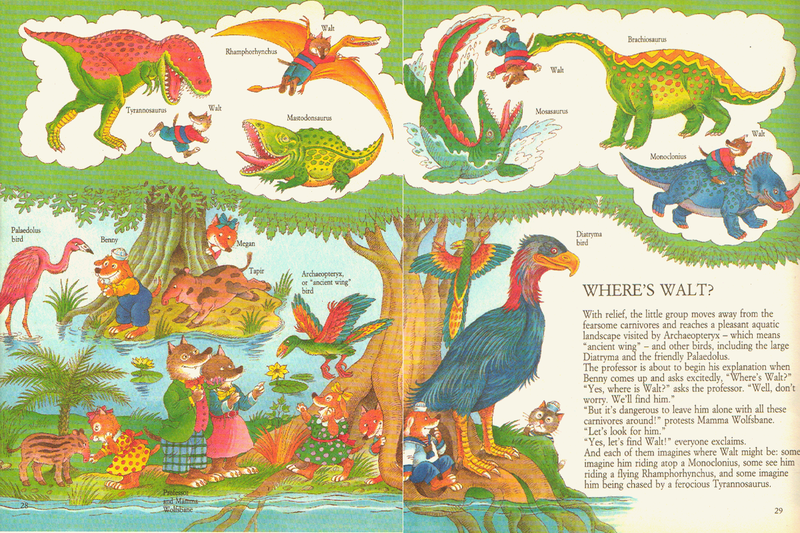 Archaeopteryx, in classic sparkleraptor garb, is relegated to a spread dedicated to various birds (and a couple tapirs). It's presumably the Cenozoic now, therefore we're green and fresh and inviting rather than volcanic and barren. Palaelodus stands in the background, pink and misspelled. Prof. Wolfsbane's son Walt has gone missing, and some of his supposed friends choose to imagine him chased down by a ravenous Tyrannosaurus, menaced by Mastodonosaurus, or best of all, fed by Brachiosaurus to Mosasaurus. Poor Prof. Wolfsbane, I can only imagine his reaction. 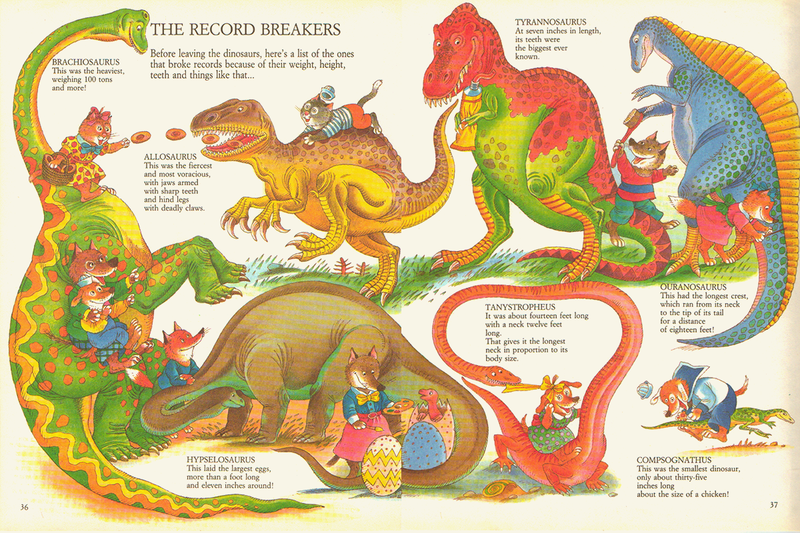 The last spread I'll share is the "record breakers," in which dubious facts and stale old canards are transmitted to a willing and impressionable junior readership. Here, we learn that Allosaurus was the "fiercest and most voracious" dinosaur, because science, and it certainly does seem excited by those jammie dodgers. Ouranosaurus gets to have the longest crest, Tanystropheus is lumped in with dinosaurs because why not, and golly: Composognathus is the size of a chicken. So to sum up: whimsical illustrations that combine old views, somewhat contemporary knowledge, and head-scratching inaccuracies. Had Melgari gone with a lighter adventure narrative that didn't purport to be an encyclopedia-lite, poetic license would have been understandable, but instead we have a book that is mostly memorable for its bizarre un-facts. At the end of 2013, we called for predictions for the palaeontological discoveries of 2014, and due to my pathetic love affair with alliteration, we called the post Prehistoric Prognostications. After the LITC crew made their guesses, we compiled those from commenters. Check those posts out for the full field of predictions. This post is all about sharing those that came the closest. Please let me know if you notice any I missed - I tried my best to be complete, but the fact is that in this palaeontological golden age we're living in, there's just a heck of a lot that happens that doesn't get much press. First up, among LITC contributors, Asher's remark that "More Deinocheirus material would be nice" was indeed fulfilled. We got it, and it was great. 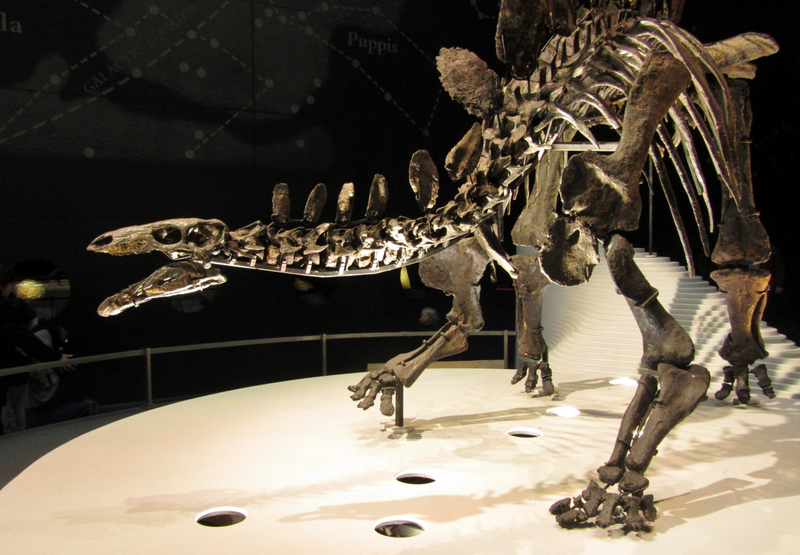 He got more carcharodontosaur material as well, with the publication of Datanglong guanxiensis. Thomas Diehl came pretty darn close to the Spinosaurus publication, predicting a "marine spinosaurid. Though given that I think the claws were for locomotion, pulling the animal forward in the mud, this might be somewhat unlikely if I'm right." It may not have been marine, but Thomas's guess is close enough to the assertions of Ibrahim et al's contentious blockbuster publication that it warrants notice. Elijah Shandseight's desire for "a big psittacosaurid" was fulfilled, though the Siberian material has not been published yet. A bit muddier is his hope for new stegosaurids: Amargastegos, Eoplophysis, Ferganastegos, Natronasaurus, and Weurhosaurus mongoliensis were all erected by Roman Ulansky [PDF link] but these seem a little shady. Giraffatitan and Matthew Haynes also mentioned Spinosaurus, hoping for a relatively complete specimen, but since the new research was published on various parts of different individuals, it sadly doesn't count. Also close was Giraffatitan's hope for "Quills/Protofeathers on an ornithopod or thyreophoran," which is close to the discovery of Kulindadromeus, though the animal is a basal neornithischian, not an ornithopod; and Leinkupal isn't a "diplodocid in Mid-Late Cretaceous rocks" but as it hails from the early Cretaceous it certainly warrants a mention as the latest surviving specimen of the family. Luis Miguez tossed a softball with a hope for "more Chinese diminutive birdie-things" and lo, there was the microraptorine Changyuraptor; the enantornithines Fortunguavis, Grabauornis, Longusunguis, and Eopengornis; the ornithuromorphs Gansus zheni and Iteravis huchzermeyeri, and more... there were a bunch. 20firebird hoped for "More of little-known dinosaurs like Utahraptor and Amphicoelias fragillimus (for A. fragillimus it's more proof it existed in the first place)", and while it hasn't been published yet, Jim Kirkland's team finally pulled a huge slab of Utahraptors from a hillside in Utah at the end of the year. Matthew Inabinett predicted "fragmentary remains of a new giant (30+ m) sauropod" and Dreadnoughtus came super-close, with an estimated length of 26m and enough fossil remains to qualify as significantly more than "fragmentary." Still, I'll count it! [Edit: Actually, there was that Argentinosaurus femur, which makes this a bullseye, thanks to Matthew Haynes for catching it]. Matthew's predicton of "more bizarre palaeofauna from Madagascar" was also fulfilled, with the happy publication of a nice gondwanatherian skull, Vintana sertichi. Like Asher, his desire for another carcharodontosaur was fulfilled by D. guanxiensis. Not a bad crop of discoveries for 2014! I considered repeating this for this year, but it seems a bit redundant, since we may as well just copy and paste last year's failed predictions and repeat them. Maybe in the future we'll do it again! There have been a great many 'dinosaur puzzle books' aimed at children over the years, the vast majority of which have been the sort of throwaway fare you'd find in a kiddies' goody bag alongside some cheap 'n' nasty plastic toys, largely devoid of any educational content. Dinosaurs! A Spot-the-Difference Puzzle Book (1995, no relation to anything involving David Norman) is a different matter entirely. 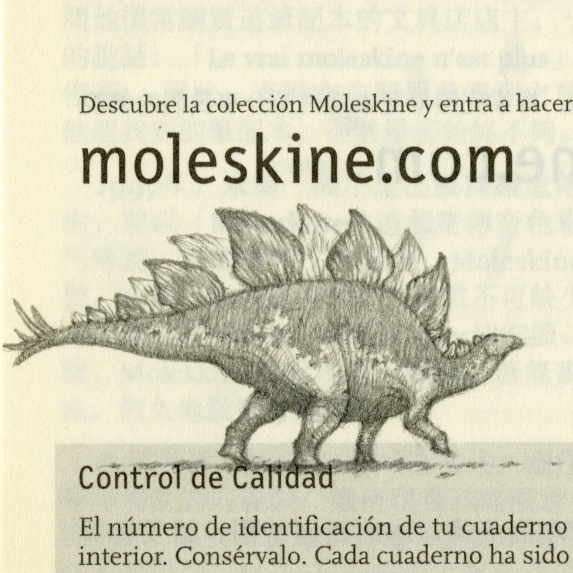 Not only is it quite lavishly illustrated, the differences between each pair of pictures are used to highlight interesting aspects of dinosaur science. It's a wonderful conceit, even if the book takes a few strange turns along the way. 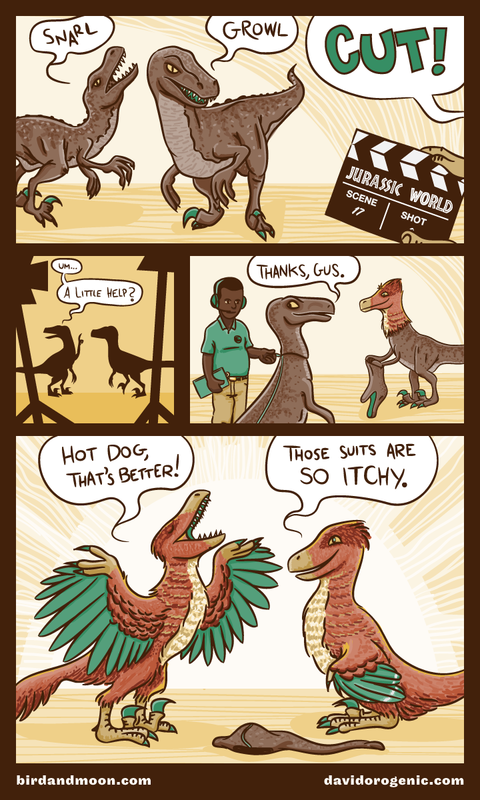 I teamed up with Rosemary Mosco of Bird and Moon fame to illustrate this comic she wrote, offering a behind-the-scenes look at the interepid dromaeosaurs who endure hours in stifling rubbery costumes to deliver the awesomebro thrills the world craves. It was awesome to work with Rosemary! I'm sure many of you are fans of her already; be sure to check out her on-line shop. You can also support her at Patreon. With a new year comes a new design for LITC, keeping up with our roughly two year schedule for such things. I decided to go in a pop art direction this time around, after playing with different treatments, all centered around the new logo design. That logo, as revealed a few weeks back, is a sort of "back-to-basics" approach which places a big-headed chasmosaurine in a heart. When working on the header, I liked the idea of using multi-colored, comics-inspired panels and it worked nicely with a cropped detail of our new chasmosaur mascot. If you're reading this on a feed reader, hop on over to the blog site itself to see the design in its bright and shiny glory. 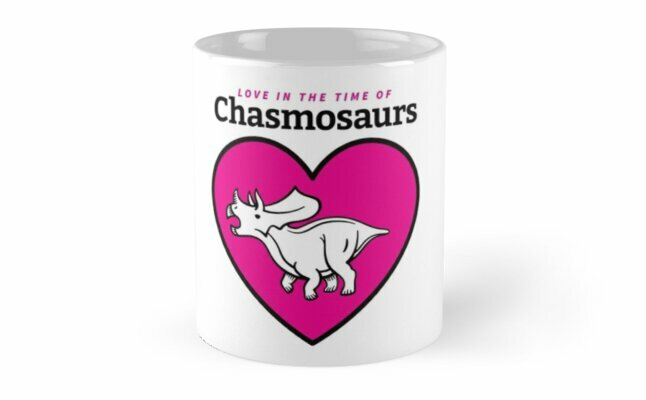 As announced last month, I've finally made some blog-specific merchandise featuring the new logo, available in pink and black or in all white. Both versions are available on a wide variety of products, from garments to mugs to device skins and cases. All proceeds from these items will go to support our activities: purchasing books, visiting museums, and possible future web-hosting related costs. A beautiful LITC mug! I swear, that's what it is, even though the handle isn't visible. Thanks for all of the support you've given us over the first five years of LITC, and here's looking forward to many more!